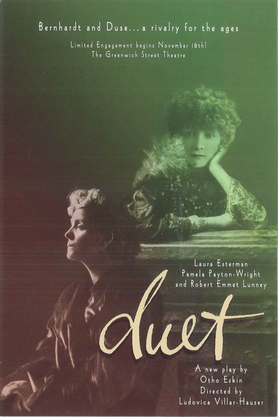 DUET is a play about the great French actress Sarah Bernhardt and her archrival, the Italian diva Eleonora Duse. The ghost of Sarah Bernhardt appears in Eleonora's dressing room in a theater in Pittsburgh in 1923 just before the last performance of Eleonora's life. The two great actresses clash as each relives the events that shaped their lives. They recall their first experiences in acting and their love affairs. Most importantly, they return to their tumultuous encounter when Eleonora appears in Paris to challenge Sarah directly and Sarah betrays Eleonora – in art and in love. In the end, each woman comes to terms with her life and with each other. "Ms. Villar-Hauser has seen to it that the actors play naturally to all three sides of the thrust. Having the audience encircle the stage so that everyone has either a front or second row seat enhances a feeling of an intimate and enlightening visit with these two great actresses."